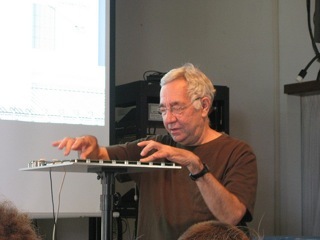 Professor David Wessel, Director of the Center for New Music and Audio Technologies, passed away on October 13, 2014 at the age of 73. We invite people in the Bay Area to come by CNMAT on Friday, October 17 between the hours of 1 p.m. to 6 p.m. to share stories and celebrate the life of this great person and giant in his field. The Main Room at CNMAT will be open to all those who wish to visit. The many and beautiful statements from David's friends and colleagues will be posted on the walls and David's instruments and music will be there. This is an informal open house for the local community. A larger gathering to celebrate David's life and work is being scheduled in November and will be announced on this page in the coming days. Everyone -- especially people outside of the immediate area -- will be welcome to participate in this important event. We hope to see you and look forward to sharing our sadness and stories.